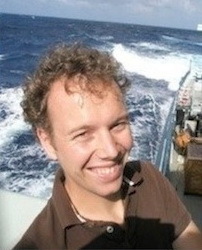 ARC Research Fellow at the Climate Change Research Centre at the University of New South Wales. Associate Investigator at the ARC Centre of Excellence for Climate System Science. Recipient of a 2013 Discovery Early Career Researcher Award (DECRA) by the Australian Research Council on "Inter-ocean exchange around Australia and its relation to regional and global climate". Investigating the time scales and pathways of the global ocean circulation using Lagrangian trajectories, with particular interest in inter-ocean exchanges and marine connectivity. Supervising the PhD projects of Shirley Qin (started July 2012) and Christopher Bull (started June 2013), the honours projects of Nicholas Calhau (started February 2014) and Keith Huang (started July 2014), the Masters research project of Steffie Ypma (started August 2014), and the postdoc research project of Paulina Cetina Heredia (started March 2013). Teaching Physical Oceanography / Oceanographic processes (MSCI3001 / MSCI5004). The use of (numerical) Lagrangian trajectories for global ocean pathway analysis. Agulhas leakage, Tasman leakage, the Southern Ocean and the global overturning circulation. Ocean connectivity from a physical and biological perspective. CCRC, The University of New South Wales, Sydney.